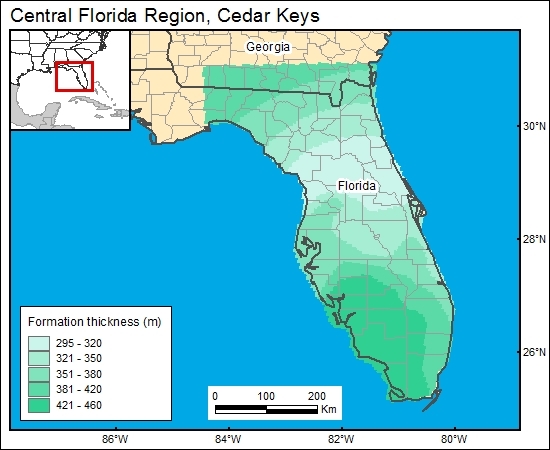 Currently no maps show the thickness distribution of the Cedar Keys and/or Lawson Dolomites (although Winston  presented thickness maps of various units within the Cedar Keys Formation). A lithologic log from a waste-disposal well in Muberry, Polk County, Florida, records a thickness of 1,260 ft for the lower Cedar Keys and Lawson Dolomites. Randazzo (1997; his fig. 4.2c) presented a map showing the thickness distribution of the Upper Cretaceous interval across the Florida Peninsula. His map shows that (1) the entire Upper Cretaceous interval in Polk County is about 2,400 ft and (2) the thickness of the Upper Cretaceous does not vary that much across Florida. The lower Cedar Keys and Lawson Dolomite compose about half of the Upper Cretaceous section. We use the Upper Cretaceous isopach map of Randazzo (1997) and proportionally scale it to reflect the thickness distribution of the lower Cedar Keys and Lawson Dolomites. Winston, G. O., 1994, The Paleogene of Florida, v. 3. Lithostratigraphy of the Cedar Keys Formation of the Paleocene and Upper Cretaceous age-Peninsular Florida and environs: Miami Geological Survey, 52 p.